Discussion in 'Shoes, Shoes, Shoes' started by Lena, Dec 6, 2003. If you are -or plan to visit- London, the first EU retail flagstore by VANS might be well worth your time. Back in the 60s, Carnaby Street epitomised Swinging London and a fashion scene that focused on the talents of local tailors and designers. Now Carnaby has become a major location for labels opening 'flagship' stores. Base London, Mambo and Miss Sixty have been joined by skate label Vans, which officially opens the doors of its new European flagship shop at No.47 on Saturday, December 6th. To celebrate, there will be skate demos from 1pm featuring star riders including Geoff Rowley, Jim Greco, Tony Alva and Steve Caballero and bike action from BMXers Sebastian Keep, Zach Shaw and Jon Taylor. There is an exhibition of Vans slip-ons customised by celebs including Liam Gallagher and Nicole Appleton, Busted and Stella McCartney - all the shoes will then be auctioned off and the money raised donated to Surfers Against Sewage and Regain. Around 4pm, The Lost Prophets are due to meet fans in the shop, but please go easy on the fellas. According to their website, they are well knackered. Are Vans still that cool?! I remember wearing those things when I was 13.
i htink they are. if worn the right way. yeahn sorry pony and suede. Well,the only sneakers I own nowadays are my Puma Easy Riders and vintage Chuck Talylor's. I dunno, I guess they are like Clark desert boots... Never really hot, always stylish? 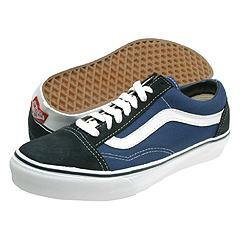 Though I have to say Vans are definitally lower on my list of classics. I hate Vans myself. Vans are super cool, but I thinky ou kidn fo have to apreciate street and skate culture to liek them, I adore Chekered vans, they where all voer teh Undercover s/s 2004 runway. Maybe its this crazy obsession with the way Avril Lavigne dresses? Thanks for keeping us posted, Lena! Vans are not cool at all (they're all reage now ) but if you wear the right one (checkered, black & white) with the right sophisticated mix it can look cool. I disagree, I think checkered vans are cool. i don't really think i care if they're cool or not. i have black'n'white checkered ones & gray ones. & i'm def. not a skaterr. I prefer these, if I were going to wear Vans.